Travelers along the southern portion of the Great River Road will find a bevy of historical sites and attractions, but antebellum homes—massive, ornate pre-Civil War properties that sit along the Mississippi River—are some of the South’s most interesting attractions. Here are three you shouldn’t miss. Lakeport Plantation, Lake Village, Ark. Lakeport Plantation is the only remaining Arkansas antebellum plantation on the Mississippi River. The home now serves as a museum and educational center teaching visitors about the Johnson family (who occupied the home until 1927), as well as the cotton industry and other historical events that affected residents in the Lake Village area. Dunleith Historic Inn, Natchez, Miss. Before the Civil War, the river town of Natchez, Miss., was home to more millionaires per capita than any other city in the United States. Many of these wealthy residents’ impressive homes are now open to visitors for tours or even overnight stays, including the Dunleith Historic Inn. Dunleith, recently seen in the James Brown biopic “Get on Up”, was built in 1856 and sits on 40 beautifully landscaped acres. Several buildings on the property date back to the 1790s, including the carriage house and stables, and a dairy barn. Nottoway Plantation, White Castle, La. The largest remaining antebellum home in the South, the Nottaway Plantation House is a staggering 53,000 square feet and contains 64 rooms, seven staircases and five galleries. Built along the banks of the Mississippi River in 1858, the home also features an impressive ballroom painted in all white (including the floor). The plantation has recently undergone a multi-million-dollar renovation now features a resort with 40 overnight rooms, a restaurant, and more. Looking for some fun along the Great River Road in Louisiana? Be sure to check out these can’t-miss locations. Baton Rouge. Louisiana’s capital city sits along the shores of the Mississippi River, and you’ll find an abundance of fun in the “Red Stick.” Visit area plantations, stop by the zoo or museum with the kids, take in an LSU football game or try your luck at the L’auberge Casino—it’s all available to you in Baton Rouge. Plan your Baton Rouge visit here. Plantation country. All along the Great River Road in Louisiana, you’ll find beautiful, historic antebellum homes, many of which have lodging opportunities available. Be sure to visit the iconic Oak Alley Plantation in Vacherie, Houmas House in Darrow or—if you’re brave—St. Francisville’s Myrtles Plantation, reputedly one of the most haunted spots in America. New Orleans. If you’re ending your trip at the southern terminus of the Great River Road, well, there’s no better city to spend a well-deserved break. From Mardi Gras to live music on pretty much every corner to delicious food (don’t forget the beignets!) and intriguing history, the Big Easy offers something for every traveler. Learn more about visiting New Orleans here. Looking for more Great River Road attractions in Louisiana? You can find them here. September is Drive the Great River Road Month, a great time to explore America’s longest and oldest National Scenic Byway. Minnesota: Want to see where the Mississippi River starts its journey to the Gulf of Mexico? Visit Itasca State Park in Minnesota, where you can walk – yes, walk – across the headwaters of the Mississippi. Wisconsin: A perfect stop to see fall color, Grandad Bluff in La Crosse gives you a 600-foot-high view of the city below and the Mississippi River beyond. Illinois: Make a stop in the charming community of Galena, where you can find historic sites, tempting shopping, and toast-worthy wineries. Iowa: Want a great view? Hop aboard Dubuque‘s Fenelon Place Elevator, the world’s shortest, steepest scenic railway. Ride to the top for an astonishing panoramic view of the Mississippi River and three states. Missouri: This stop isn’t really more of a where, it’s a what: St. Louis barbecue. St. Louis has dozens of delicious barbecue options, including perennial favorite Pappy’s Smokehouse. Kentucky: Learn about the Mississippi River’s role in the Civil War at Columbus-Belmont State Park, where you can find a six-ton anchor that – along with a mile-long chain – was used to blockade the river during battles between the North and South. Tennessee: Students of American history should visit The National Civil Rights Museum in Memphis, an educational experience built around the preserved Lorraine Motel. Learn about the struggle for civil rights in America and see the preserved hotel rooms where Martin Luther King, Jr., spent his last hours. Arkansas: Don’t miss the The King Biscuit Blues Festival in Helena-West Helena, Arkansas, which welcomes tens of thousands of blues fans to the Mississippi Delta every year. Don’t miss this year’s festival Oct. 8-11. 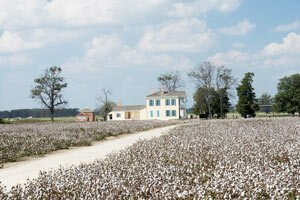 Mississippi: Traveling through the Mississippi Delta? Stop by the Gateway to the Blues Visitor Center and Museum on Highway 61 in Tunica. There, you’ll find valuable travel tips and advice from area experts. The museum is scheduled to open later this year. Louisiana: You might recognize this place from numerous movies and TV shows — Oak Alley Plantation in Vacherie welcomes visitors with an awe-inspiring canopy of 300-year-old oak trees leading to a pristine antebellum plantation. Find more attractions in each state here. Catch a glimpse of extravagant U.S. history by visiting a Louisiana plantation. Each with its own unique history and architecture, these plantations offer an immersive learning experience that everyone should experience on their trip to Louisiana. Here are just a few you should check out, though there are plenty more to see if you’re interested. One of the most photographed places in Louisiana lies in Vacherie. The Oak Alley Plantation is a Greek revival mansion situated at the end of a majestic alley of live oak trees. The colorful and ornately decorated San Francisco Plantation is known as one of the most opulent plantation houses in North America. Head to Garyville to see this mansion. Ormond Plantation is a West Indie’s style plantation originally used to farm indigo, later flourishing as a sugarcane plantation. It resides in Destrehan. Destrehan Plantation, also located in Destrehan, hosts exhibits that capture the 1811 Slave Revolt – the largest slave revolt in U.S. history. The Evergreen Plantation in Edgard is the most intact plantation complex in the South, hosting an astounding 37 buildings on the National Register of Historic Places. This plantation was even granted landmark status – the nation’s highest historic designation – for its agricultural acreage. Houmas House, or “The Sugar Palace,” got its nickname for once being the largest producer of sugar in the country – at one time producing 20 million pounds of sugar annually. Located in Darrow.